Alumicolor® 6" and 15cm Pocket Scales are a smaller version of the 12" professional solid scale. 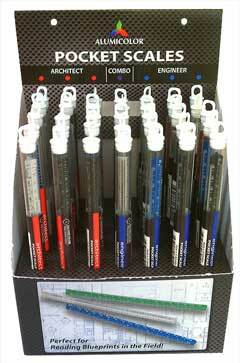 The pen-size, lightweight design provides professionals and students with a scale that can be taken anywhere. Architect, Engineering and Combination versions are also available with clip. 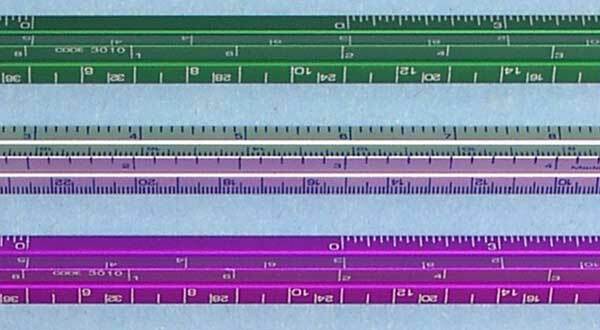 L2R™ Architect Scales were developed with calibrations that read from left to right only. This makes it easier to read than traditional architect scales, which read from left to right and right to left. 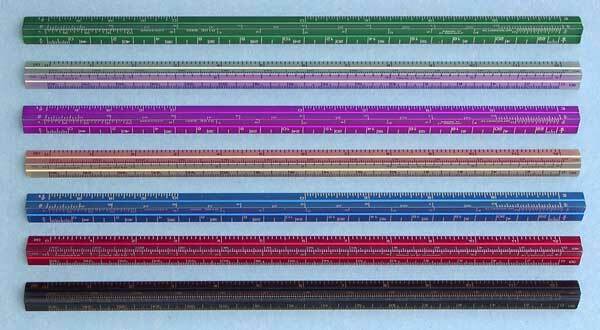 Alumicolor® offers both 4 bevel and triangular versions of the L2R™ scales. Our Pocket Scale P.O.P. Box is a perfect counter top display for our best selling products. The standard display features a mix of our most popular colors of the Architect, Engineer, and Combination pocket scales – 35 pieces in all. Choose this mix or create a custom product offering to fit your clientele. If you don’t have room on your counter top, the display has holes so it can be hung from a peg board in your A&E section. MSRP for the display is $225.00 for scales without clips and $240.00 for scales with clips. Packaging: Clear round plastic tube with hang cap. Dimensions: 0.359" wide per side. 3300-0 Point-of-Purchase Pocket Scale Display Box - 35 Scales $225.00 Assorted - Selection of our most popular colors or you choose! 3301-0 Point-of-Purchase Pocket Scale Display Box - 35 Scales with lip $240.00 Assorted - Selection of our most popular colors or you choose!